I wanted to start highlighting a client of Flawless Lashes each month again. I have a few reasons for doing so, one is just to share the variety of fantastic, interesting people who we get the pleasure of spending time with each day at Flawless Lashes. The other is to show you some clients who take very good care of their lashes, and what their results with their extensions are. So on that note, I would like to introduce you to Sara. Sara takes amazing care of her extensions, she comes every 3 weeks like clockwork, and has nearly 70% of her eyelashes in tact each time she arrives. In addition there is not a single trace of any eye makeup, dirt, debris, sleep, nothing, just squeaky clean eyelashes that I can easily extend to a beautiful, full look. I’m a partner in an Atlanta based, national recruitment firm, HRworks – www.HRworks.com. We just celebrated our 14th year in business (pretty excited @ that). We source & recruit top talent for Fortune 1000 companies. My team delivers awesome results! I started with extensions 1 ½ years ago. I saw them on someone and had to have them. In fact, I made an appt that very day. Great decision! I don’t just LIKE them, I LOVE them. They do make morning make up easier but what I love is regardless of the amount of time I spend on makeup, my lashes always look awesome. Anywhere! Any time! I’m committed to my fill-in every 3 weeks. I book in advance (love the online appointment setting!) and put on my calendar like any other critical appointment. I have to say that not only do my lashes always look great; they look natural. Strangers stop me all the time; make-up artists have not been able to tell that I have extensions. It’s a riot! That’s right, she uses mascara, but honestly I didn’t even know until she told me, because when she arrives to her appt it is not her lashes at all. I think the key here, is not only does Sara remove her makeup before her appt, but she also does so during the days between her appts, so it is not built up to the point of being impossible to remove. 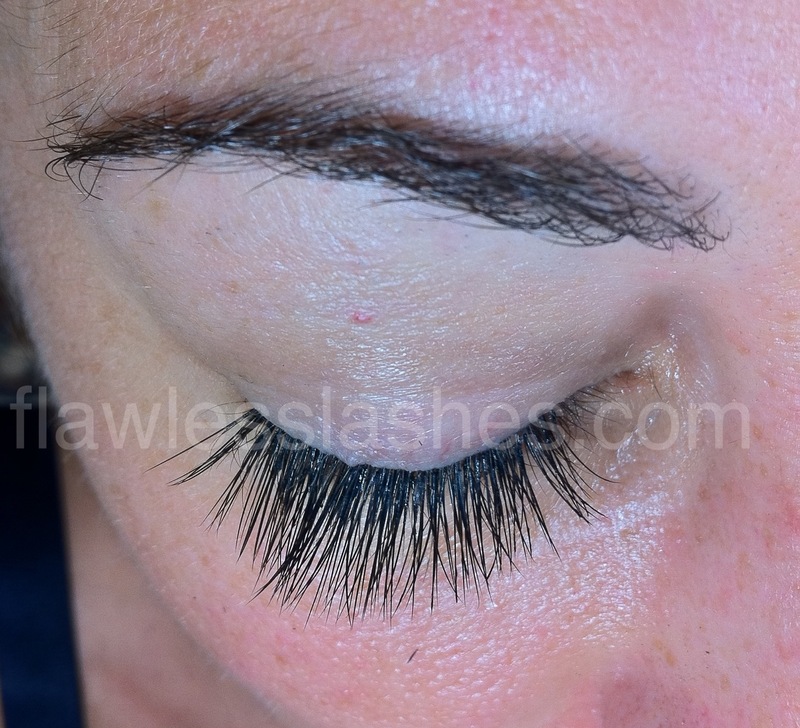 And this is what Sara’s lashes look like, most all of the time, they are never spiky, sparse, gappy, or sad looking. Just Flawless Lashes!